Are you interested in real estate in Bulgaria by the sea? Do you want to live in comfortable apartments in the Mediterranean climate conditions surrounded by clear and pristine nature? 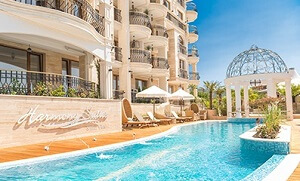 We invite you to consider our suggestions and buy an apartment at the St. Vlas resort in Bulgaria in the unique residential complex "HARMONY SUITES-20". "HARMONY SUITES-20" is a gated complex of apartments located in close proximity to the sea, pine forests and mountains. This place is unique for its clean air, and it is proven by the fact that not far from complex Harmony is located a Bulgarian health spa resort specializing in the treatment of respiratory diseases. Those who want to buy an inexpensive seaside apartment in Bulgaria at the apartment complex "HARMONY SUITES-20" will get a unique opportunity to reside or come up on vacation to one of the most peaceful and quiet resorts of Bulgaria. The complex building with residential properties has been designed so that almost every apartment has a great view of the sea, which is at a distance of only 200 meters. A unique climate, clean healthy air, lots of greenery, walking distance to comfortable beaches - all this has become such a stimulating factor, that the number of people wishing to purchase an inexpensive apartment in Bulgaria near the sea at affordable prices is increasing from year to year. • This complex is just perfect for rest and accommodation for families with children. Within walking distance are located several other complexes "HARMONY SUITES" with a developed infrastructure network, available for use by those living in "HARMONY SUITES-20". The flats or apartments that can be bought in Bulgaria at an attractive price are equipped with all necessary furniture and appliances for immediate moving in and stay. If you are interested in buying apartments in Bulgaria, you can see photos of the proposed options. We are ready to assist you in the selection of the option suitable for your financial capacities, in providing legal assistance for the registration of real estate and advising on visa issues. Hydrolysis and electrolysis system for water cleaning of the swimming pools in Harmony Suites.